Cut 8-inch round of cooking parchment paper. Place in bottom of air fryer basket. Spray with cooking spray. Unroll dough, and tuck corners under. Shape into 10-inch round with thicker 1-inch border. Press into air fryer basket on top of parchment. Press 1 1/2 inches up side of basket. Set to 325°F; cook 10 minutes. 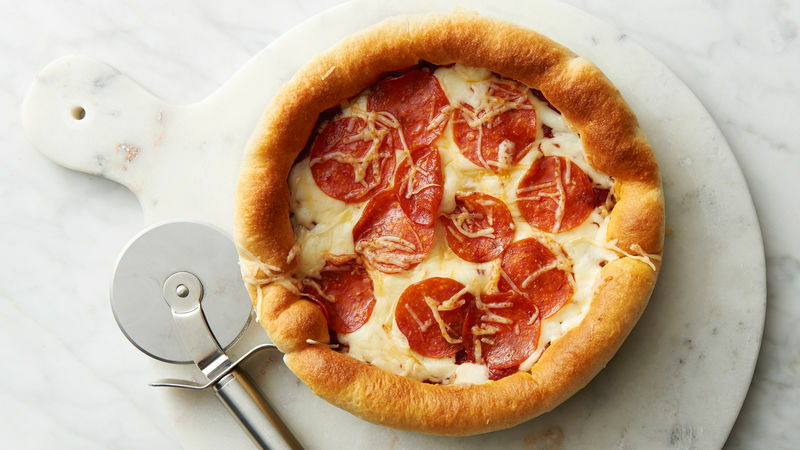 Turn pizza crust over on counter; remove parchment, and replace in air fryer basket. Cool 2 to 3 minutes or until cool enough to handle. Using fingers, press center of crust down, making 1-inch border. Brush sides and top of crust all over with olive oil. Place in basket. Cook 5 minutes longer. Top center of dough with pizza sauce. Top with mozzarella cheese, then top with pepperoni, followed by Parmesan cheese. Cook 4 to 7 minutes longer or until cooked through and cheese is melted. Cool 2 minutes. Remove from basket with rubber spatula. Flipping the crust halfway through cooking ensures a crispy crust for the pizza. Serve with ranch dressing for extra creaminess. Brushing with olive oil helps crust to brown and crisp nicely in air fryer.